Food Lovers Market in Noordhoek, Cape Town, claims it’s the first retailer in South Africa to truly invest towards a zero waste solution by adopting a composting method which breaks down cooked food waste, helping to minimise the strain on overflowing landfills. Husband and wife team, Christo and Suzette Viljoen, have set the standards high with waste management at their Food Lovers Market in Noordhoek, by aiming for zero waste output. 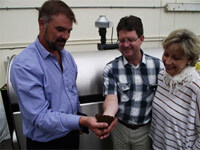 As cooked and raw food forms 50% of waste in landfills, the Viljoens were eager to adopt a composting method that would reduce the store’s contribution to landfill waste and are the first retailer in South Africa to install the Green Genie JK 5100 industrial composting machine, which is said to do just that. Green Genie’s JK 5100 is the first industrial composter of its kind in South Africa which allows cooked food (as well as raw food) to be processed into compost, eliminating strong odours left by traditional composting methods. Organic pellets are added to the food waste to break it down and the process is aerobic so no harmful gasses are released, as oppose to environmentally-harmful methane gas released by landfills, making the system far more environmentally friendly. During composting, food waste heats up to 70°C killing harmful bacteria including E.coli and salmonella. The two-chamber system works on a four-week cycle and can hold up to 2,5 tons of waste, producing up to 400kg of compost every two weeks. Picture: Stuart Lindley, MD of Green Genie, with Christo and Suzette Viljoen from Food Lovers Market Noordhoek, admiring the first compost produced from their new Joraform industrial composter.